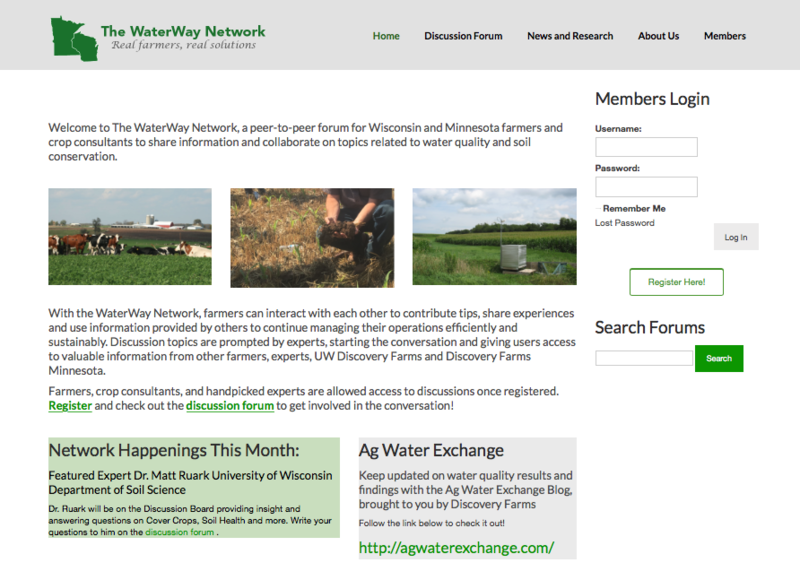 The Discovery Farms Programs of Wisconsin and Minnesota are excited to announce the launch of an online, farmer-only discussion forum. This discussion forum, known as The WaterWay Network, is a password protected, online platform for farmers, crop consultants, and hand-picked experts only. Do you have questions about cover crops, nutrient management, soil health, or water quality? Members on the site can provide you with the answers you are looking for. By joining The WaterWay Network, you will become a part of a unique online community that focuses on conservation. Farmers and crop consultants will provide the applied knowledge and experience, while Discovery Farms and University experts will bring science to the discussion. Getting started is simple and FREE. If you are a farmer or crop consultant, register for an account today and get your questions answered at www.waterwaynetwork.org.